The Mosel River rises in the Vosges Mountains passes through France and Luxembourg, waters a small part of Belgium along the way, and finally enters Germany on a meandering path towards its union with the Rhine. The river, as if trying to resist this final surrender to the Rhine, snakes slowly past the rolling hills, pretty towns and ancient castles of the softly cut Mosel Valley. The valley’s slopes aren’t as steep or high as the Rhine’s narrow gorge, but the arresting landscapes, castles and abundance of vineyards easily compensate for this. The entire length of the Mosel is punctuated by vineyards: French Moselle produces light, largely unremarkable wines; in Moselle Luxembourgeoise considerable amounts of light, often fizzy, and very refreshing, wine is made. But it is the central German passage of the river, where great walls of slate rise from its banks, that truly classic wine is crafted. This German wine region has, for most of its history, been known as Mosel-Saar-Ruwer, but on August 1st 2007 this title was officially shortened to Mosel, for possibly obvious reasons. The region encompasses the Mosel Valley, and the valleys of the Saar and the Ruwer near Koblenz and Trier, Rhineland-Palatinate. The Saar and Ruwer are small tributary rivers of the Mosel. The wines of Mosel are outstanding, mainly Riesling, the best of which are defined by a crystalline clarity and evanescent beauty. The uniqueness of these wines is down to the uniqueness of the conditions that the grapes are grown in. The slopes on which the vines grow are among the steepest in the world. At the Calmont vineyard near the village of Eller vines cling to a 76-degree incline, the most vertical vineyard in the world. All Mosel’s vines are positioned on south facing slopes to catch as much of the sun as possible, but even on a good year the region only gets one-third the light that Provence does. The slate of the Mosel’s banks plays a crucial role in nurturing the vines, its porous nature and heat reflection helping ripen the grapes in these precarious conditions. Magically, the slate also lends Mosel wine its distinctive flavour, a slatey, crisp, winter bite, found in no other wine. Most years it is nigh on impossible to achieve full ripeness, but the Riesling grape somehow manages to make wines of enormous finesse specifically when it’s under ripe. The middle Mosel has a dizzying number of exceptional winemakers crammed into a small area. Even with such a high standard some growers and villages manage to stand out. The diminutive village of Piesport is surrounded by the Goldtropfchen, a steep, south-facing amphitheatre of vines. Goldtropfchen is world famous for its gently honeyed wines with a bewitching fragrance and breed. 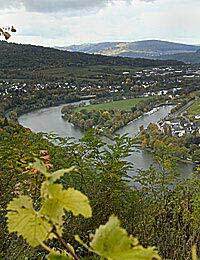 Further down river is Braunberg where Juffer is made, a golden full-bodied wine that in the past was considered Mosel’s finest. A ‘Dr H Thanisch Brauneberger Juffer Riesling Spatlese’, 1999, is a good example of a contemporary Juffer. Typical for Mosel wine it’s relatively low in alcohol, at 9%, with a slight petrol hint on the nose. A slight spritz the lifts the creamy flavours of orange peel, lime and sherbet, not particularly complex, but charming none the less. At Bernkastel the sheer slate banks raise dramatically, a wall of green vine and grey stone above the town’s rooftops. Here we find the Doctor, arguably Germany’s most famous vineyard. In the 14th century Prince-Bishop Boemund II of Trier was, allegedly, cured from a terminal illness overnight after consuming two bottles of the wines of the vineyard, hence the name ‘Doctor’. 2002 ‘Bernkasteler Lay, Riesling Eiswein Dr Loosen’ is a great representative of doctor wines, plump with a mouth-watering zest. These wines are outstanding, as are those from each successive grower along the river. Berkenstaleler is marked by flint flavours, the wine from Graach is softer while those from Wehleners are a richer variety. The best of these share a pale gold colour, honey and flower frivolity and characteristic piquancy, a nose of relentless grape. The valleys of Saar and Ruwer are much smaller, open and more exposed than the Mosel, prone to cold and therefore even harder to grow grapes in. Growers such as Egon Muller battle against the elements in the Saar to ripen their fruit. In the Ruwer, which is a mere stream, it is perhaps more of a struggle. It is perhaps only tree or four years out of ten that these growers pull off the feat of making a successful vintage, but when they do it is always worth the wait. Egon Müller’s Scharzhofberger is wonderfully sweet, celebratory wine, but as one of the rarest is also one of the most hunted wines from the region. The wine of Saar and Ruwer is generally similar to Mosel wine, with an apple-like bite, honey flavours, but more markedly, the taste of steel. Mosel is arguably the greatest wine region in Germany, the producer of magnificent and unique wines, unlike anywhere else in the world.